There is a very obscure Scott Walker track, long forgotten now, except by the scant few who have fallen in love with it, called Time Operator, from the singer’s 1970 album ‘Till The Band Comes In’. It is an especially pretty song, in which the protagonist conducts a make-believe affair with the speaking clock. “You just picture Paul Newman,” Scott sings, “and girl he looks a little like me.” The telephone adds a particular sense of mystery to relationships, whether make-believe or painfully real, due to the ambiguity wished up by separation and distance. “Could she really be that nice?” One wonders. “Could she really be that funny?” And then the nerves and harsh light of reality snatches that away when meeting eye to eye. Of course this is only of note when the protagonists are beautiful, shy and lovelorn types in the Richard Burton and Elizabeth Taylor mould, eternally in love but persistently at war. Not hunched over, distasteful loners using the telephone to pester and stalk. But we are inhabiting a particularly romantic sphere here, so the former is, of course, the case. 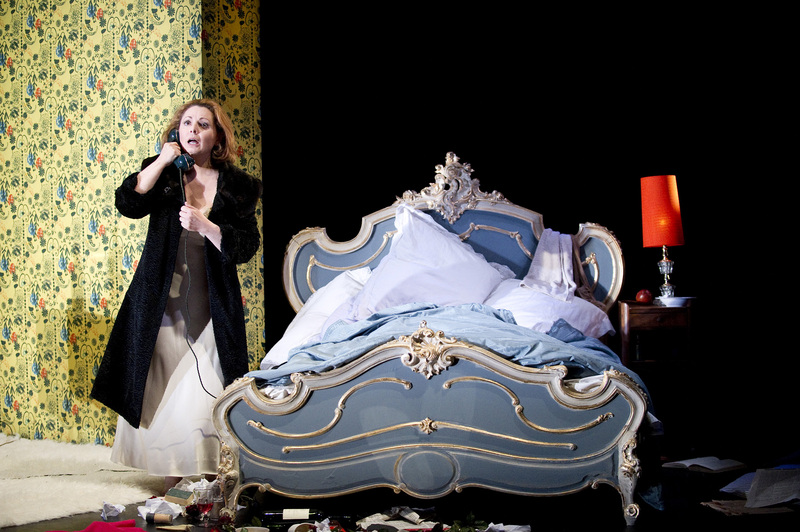 La Voix Humaine, a one act opera by Francis Poulenc, based on a monologue penned by that inimitable genius of the French avant garde, Jean Cocteau, must have been one of the first works to consider the effects of the telephone on love. The brisk, 55 minute piece, depicts a lonely woman recovering from taking an overdose of sleeping pills, making a phone call to a former lover, on the eve of his wedding. The distance and shelter that the telephone offers lulls the woman into believing she can alter an irrevocable situation from afar, she is of course mistaken. The way the telephone cord lingers around her neck during the final minutes of the performance and seems to twist like a constricting snake, suggests that the emotional trauma inflicted by their break-up is, most likely, irrevocably fatal. “Je t’aime, je t’aime, je t’aime,” she whispers, as the music concludes. Everything rests on it, nobody is free. This problem was solved by transporting the production to the cosy Linbury Theatre, which sits in the rather grand shadow of the Royal Opera House itself. The London Sinfonia (a much more compact 38 players) was drafted in and a new, purely dance work, for the first half, in support of La Voix, was created, choreographed by Aletta, with a completely new score composed by none other than the irrepressibly mysterious former Walker Brother himself, Scott Walker. Scott and Aletta’s working relationship stretches back to Drifting and Tilting, a Barbican production of Walker’s songs from his experimental and almost impenetrable recent albums Tilt and The Drift, which saw British pop luminaries Damon Albarn and Jarvis Cocker performing Walker’s oeuvre. Scott, renowned for being one of pop’s great absentees, got in touch with the show’s producer and suggested that a handful of the songs feature an element of choreographed dance. Aletta was of course recommended for the job, and the partnership was so successful that she turned to Scott when she was in need of a new soundtrack. The new work would become Duet for one Voice, based on Le Bel Indifférent, a Cocteau play written for Edith Piaf, featuring a woman pleading for the attention of her lover, only to be met with constant and complete silence. The scenario is turned on its head here and features a man pleading for the affection of his lover, only for her to sit through his protestations and pleas in silence, her face covered by a morning edition of Le Monde. Walker’s score is intimidating, as all of his recent work has proven. The multi-layered beauty found in Tilt and The Drift can only be discovered after repeat listens, and the same is no doubt the case here. The music is varied and often jarring, the dramatic and loud stops and starts which dominate The Drift return here, as does a musical experimentalism which sees, at one point, a chorus of barking dogs dominate the recording, followed by noisy industrial drones. A solo trumpet consistently returns throughout the work, playing some wonderfully melancholic jazzy tones, which brings to mind dark street corners and sultry neon tragedy. The narrative of movement on the stage, seems to play out the different clauses and stages of sexuality, from rejection to acceptance, the ecstasy and passion of carnality, from connection to disintegration. What is presented is, of course, an opposing and imagined reality, it could be reality, quite easily, it all depends on the say so of the woman, who sits deaf to the simmering sexuality, engrossed in her newspaper, her foot turning clockwise, repetitively, maddeningly, inpatient and uninterested. 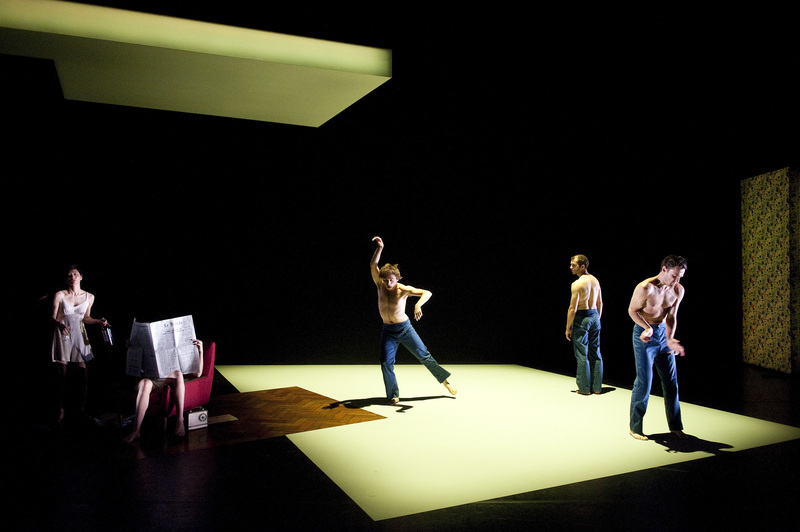 Other opposing realities are explored by the dancers too, what if the lover responds, what if communication springs into life, does it end blissfully, or in the kind of despairing phone call seen in La Voix Humaine? 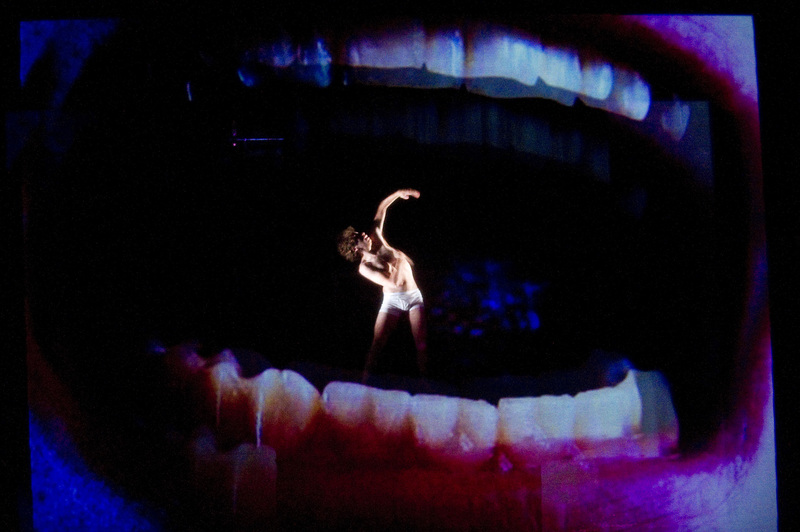 And yet, as the opening scene of the production reminds us, which depicts a half naked man maniacally gyrating inside a large red ruby lipped mouth, everything begins with desire and often ends up in trouble. If all this seems very far removed from the traditional operatic fare that one expects of the Royal Opera House, then this is because the production was commissioned by the Royal Opera House 2. ROH2 is the contemporary arm of the ROH, or as Alison Duthie, the head of ROH2 labels it, the Opera House’s “permeable skin,” because of its ability to work with different companies and commission new works. The aim of the organisation is to push new art forms and promote and commission new and contemporary opera and dance, in an attempt to widen the mediums audience.